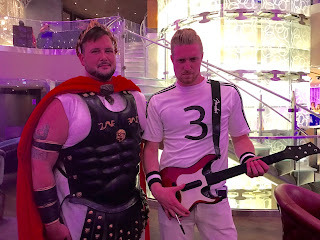 LAS VEGAS DAZE: Halloween Party in Las Vegas! Halloween Party in Las Vegas! You might think I would be tired of going to Las Vegas as this year my trips have been so frequent, but there's alway something new and exciting to do and so many friends to meet up with, that I'm always excited to go to Vegas for my vacations! 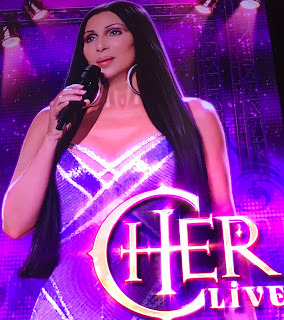 My flight out of San Jose was on time and an hour and 10 minutes later I was in Vegas where my Cosmopolitan Escalade driver was waiting for me. A few minutes after arriving at Cosmo the VIP lounge had checked me into my requested room type the studio terrace. I prefer this type of room over the one bedroom terrace due to the bath being in the entrance of the room instead of looking out over the strip and letting morning light in through the shutters. However many times I forget to remind my host that I want to be downgraded and end up in the one bedroom terrace instead. 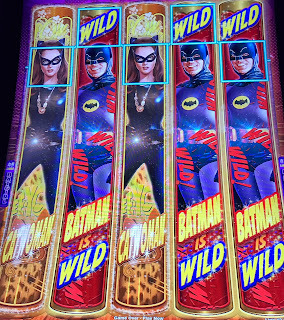 I quickly unpacked and made my way into the casino where I found and played the new Batman, Dark Knight game! I was sorry I found it, LOL! Pays were low and features hard to come by but I'll try it again on a future trip just in case I was just unlucky that session. It felt great to have such a nice bonus and get back the money I had lost on the previous games. It was time to meet my friend Claudia who lives in Vegas and have dinner at Cosmopolitan's Wicked Spoon Buffet. Claudia had her Mom with her who recently moved to Vegas, along with her Aunt and her friend Monica who were visiting from New Jersey. I forgot to take a photo of all of us together darn it! Claudia's Mom, Aunt and friend Monica were so sweet, and it was fun to eat dinner with them! The best dish on the buffet was made to order and it's the dish that has the shrimp in it below. 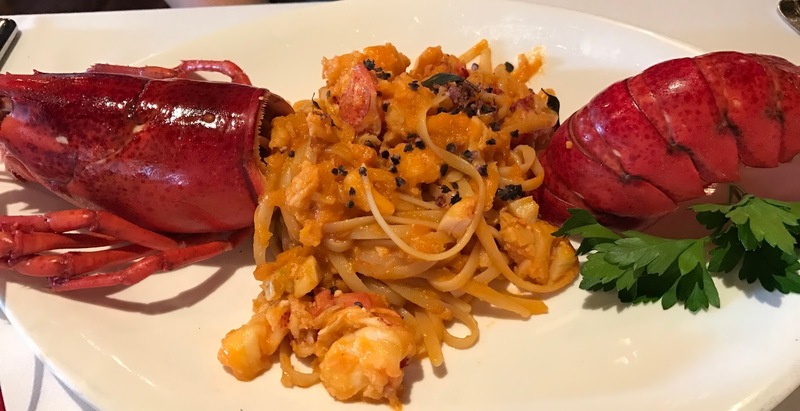 While I only had them add shrimp to mine, there's lots more items you can add while they cook it up in front of you at one of the buffet stations. 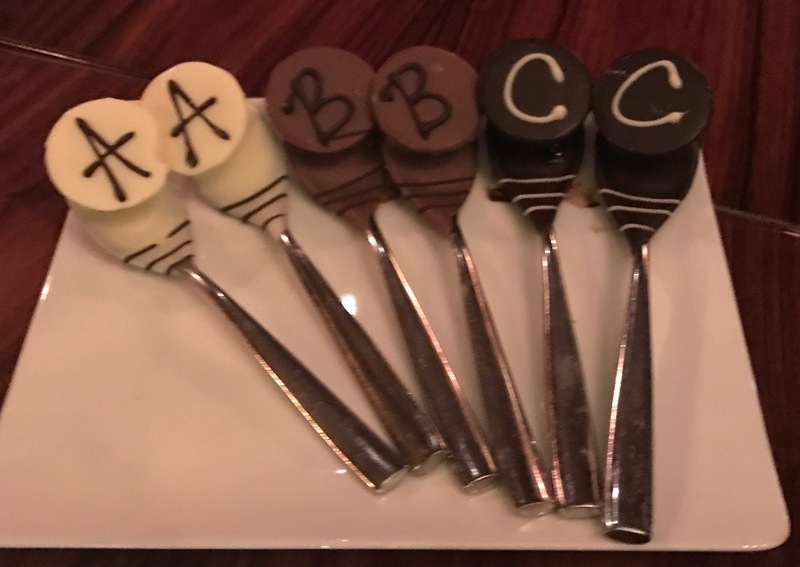 Desserts are always good at Wicked Buffet! After dinner it was time to gamble. 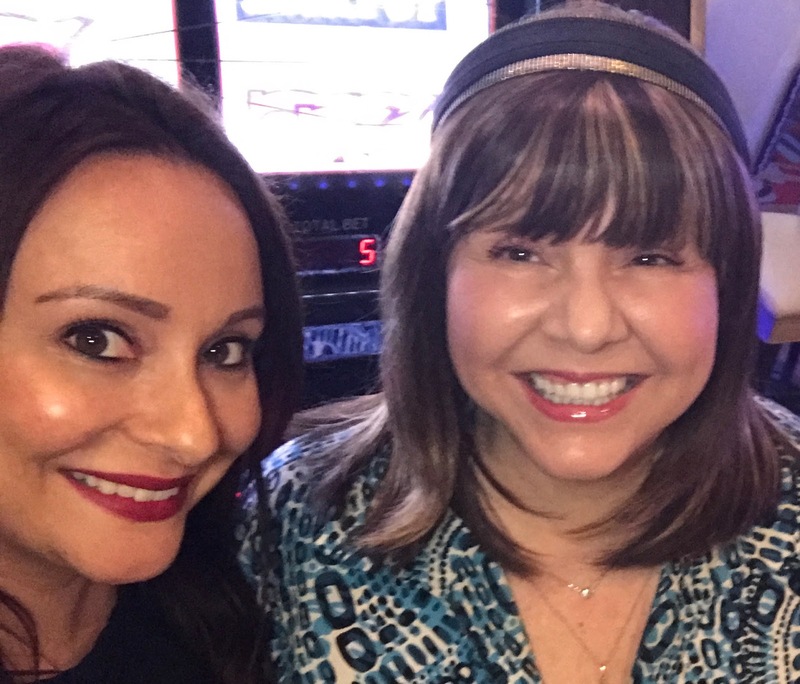 Claudia's Mom, Aunt and friend went off to play some slots while Claudia and I pooled our money for some joint slot play! After Claudia left to return home, I had some wins on Lightning Link. 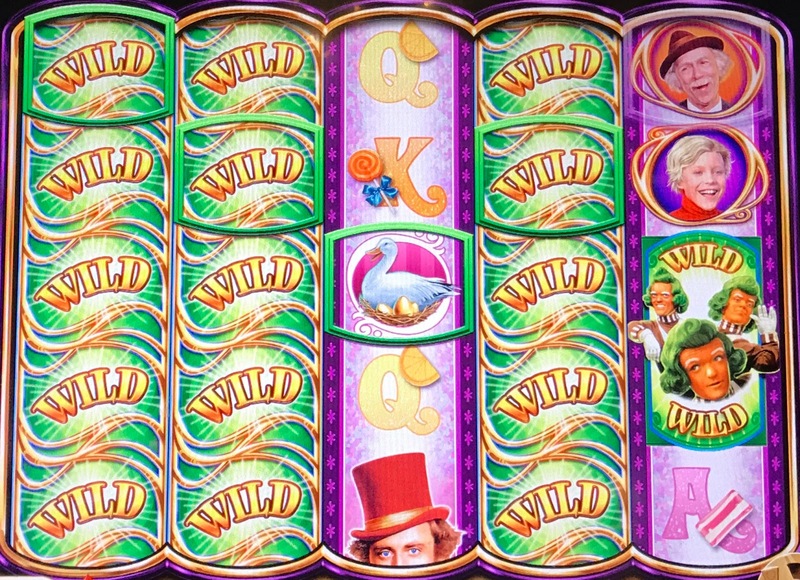 You can check that video out at this link:https://youtu.be/q2PwkyOLZFs Lightning Link is a must play for me very trip ever since I hit the Major twice playing it at Palazzo months ago. I like the new Lock it Link slot game that is a clone of Lightning Link. Unfortunately I haven't had any big wins on it yet though I've witness other slot players doing well. 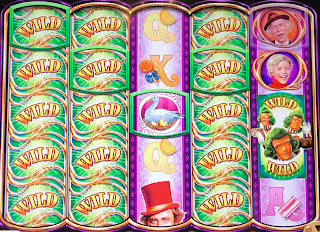 I decided to play some Wonder 4 Jackpots and had a couple nice wins on it. Link to video of Crazy Money Deluxe if you are curious about this game. I played a bit of Buffalo Gold and had a couple decent bonuses. I've never cared for the Buffalo games that much but as you will see at the end of this trip report, I love Buffalo Gold and Buffalo Grand now, LOL! I played long and hard tonight staying up until 5am so even though I had plenty of wins I stayed too late at the slots and went to bed down for the day. The game below that I won $200.00 on plays a lot like my old favorite Triple Cheeseburger Deluxe game in the bonus. It's called Triple Golden Cherries with Sprinkles on Top. Next morning I slept in late and had lunch at The Henry. This turned out to be a mistake as my green salad with grilled shrimp added to it was not very good. 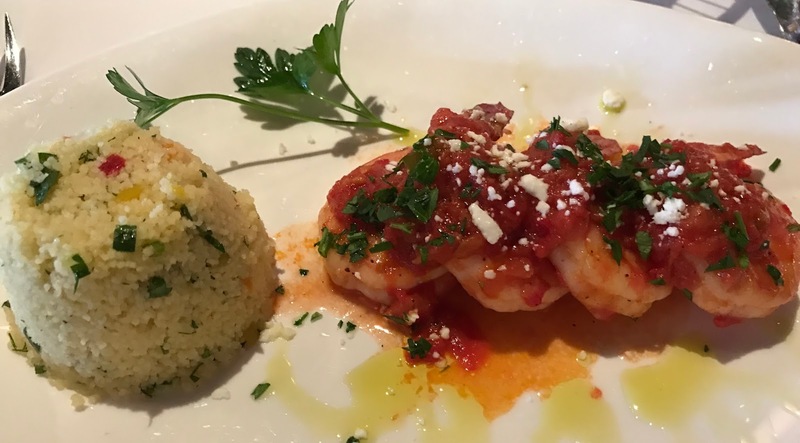 The tomatoes were mushy and the shrimp had a fishy taste to them. I was a bit worried the shrimp were old and I would get sick, but I didn't so I guess they were okay, but they didn't taste good. After the lousy lunch I needed a good drink so I went and played some video poker at the first level of the Chandelier lounge. I ordered Becky with the good hair which is a favorite drink of mine since I first tried in a couple months ago. When you put your money in the VP game at the bar the first drink is free. After that you have to wait for the machine to give you a ticket for another drink. My ticket came out after 15 minutes of steady playing. If you take a minute or more break from playing VP it can reset the timer for the drink tickets. I was playing quarter VP at $1.25 a hand. I was not winning so when my drink ticket game out I ordered another Becky with the Good Hair and left to play slots. Below is my cocktail, yum! 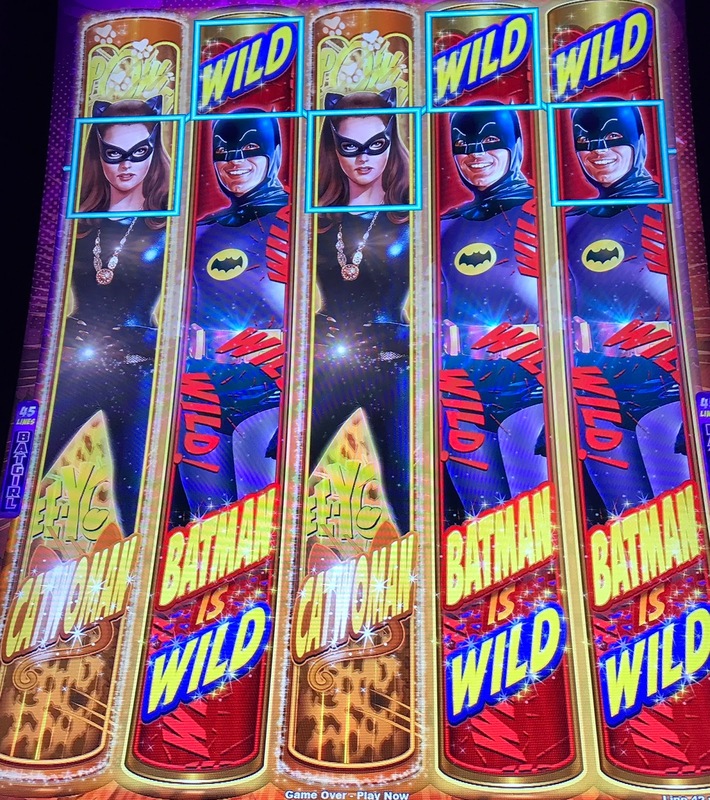 Things were looking up for me by playing games I don't normally play so after losing at Buffalo Grand I tried the Batgirl and Catwoman slot next to it and what a shock when I hit this for a big win! Check out the video to see how that happened! Rex was joining me this weekend in Vegas. We were going to dinner at Gordon Ramsay's steak house at Paris with other Vegas Fanatics and Rex's plane arrived just in time for him to check in, unpack and join me in taking Uber to Paris. Yeah, I know we could have easily walked it but the weather was raining and so we didn't. Rex and I were the last ones to arrive but fortunately the restaurant still hadn't seat our group yet. Besides Rex and me, there was Vegaschic, VCbff (Carolyn), Aaron, Derek and his wife Amy and Aaron's friend's, Corey, Ed and Scott. Aaron surprised me with a gift of a plugin battery pack for my iPhone 7 as he had read on Vegas Fanatics that I was upset my new iPhone didn't have any battery cases made for it yet (they do now so I'm all set again). The battery pack worked great during the rest of my trip, thanks Aaron! Our group was seated upstairs away from the noisy downstairs. 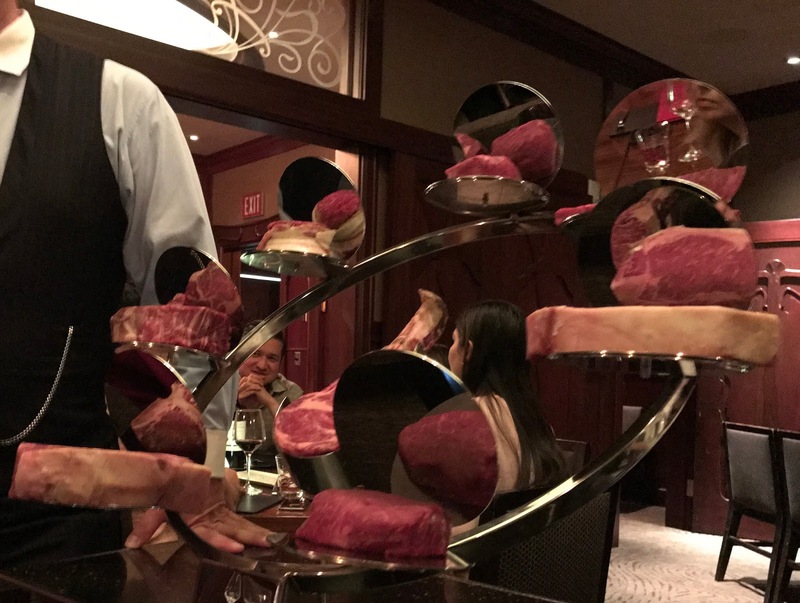 Our server explaining the various cuts of meat. The wonderful bread. My favorite is the bacon roll. Seared Hudson Valley Foie Gras with herbed goat cheese pop overs. Duo of Asparagus soup, green and white asparagus soups with seared blue crab. Market green salad with crisp pancetta and green goddess dressing. Shrimp cocktail with bloody Mary cocktail sauce. I'm not sure if this was Scott's Japanese Wagyu steak or another one. 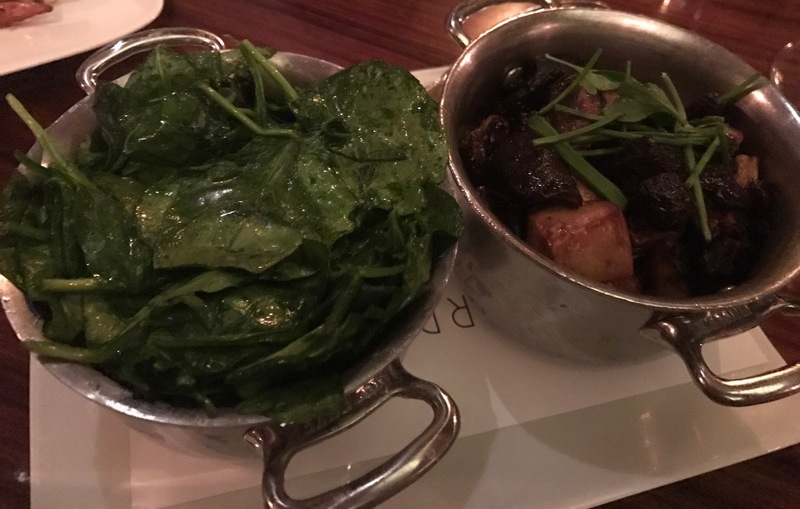 Quite a few of us ordered and enjoyed the American Rib Cap! Side dishes of mac and cheese, fingerling potatoes and potato puree. 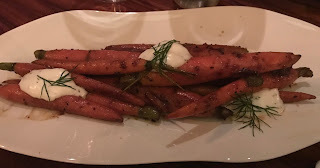 Roasted carrots with molasses and turmeric vinaigrette and dill creme fraiche. Street Corn, jalapeno, creme fraiche, cayenne and parmesan. Scott taking a photo of the certificate below regarding his order of Japanese Wagyu. I didn't know they had certificates for meat like this so I learned something that evening. 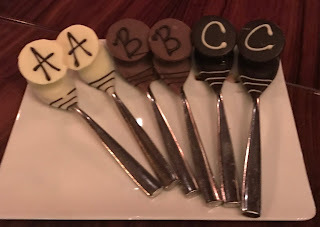 The yummy flavored Amaretto, Baileys and Chambord chocolate spoons that come with the cappuccinos. My cappuccino with the Chambord chocolate spoon! 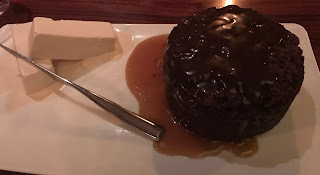 Ramsay's famous Sticky Toffee Pudding with brown butter ice cream so incredibly delicious! I think this was lava cakes, but not sure. Dinner and service was excellent! Our happy group. Corey, Vegaschic, Aaron, Scott, Ed, Derek (Amy was taking photo),Carolyn, me and Rex. 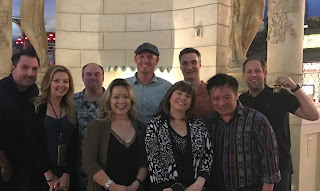 Big thanks to Aaron who treated all of us to dinner and to Vegaschic who picked up the tip for all of us! After dinner our group went to Cosmopolitan where we had a high limit pull that was lots of fun, but we lost so no photos. After a bit more gambling the group split up to return to the casinos they were staying at while Rex and I pooled our money and went off to conquer the slots! We were playing Ruby Slippers when Rex ran into a couple of his fans from the UK. In fact as we were playing Ruby Slippers which is near one of the Cosmopolitan escalators people traveling up it to the next floor would see Rex and start shouting out Lloyd or Elliot depending on if they were a fan of Entourage or his current TV show, Young and Hungry. After Jackpot Inferno Rex suggested we play the new Miss Kitty Gold and no one was more surprised then me when we got a respin feature quickly and then a bonus! Here's our video on that! 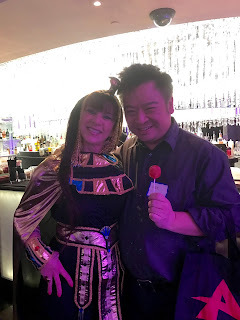 While we were playing Miss Kitty Gold a nice couple came up to us and I thought they were fans of Rex's until they told us they were fans of my youtube videos all the way from Italy! 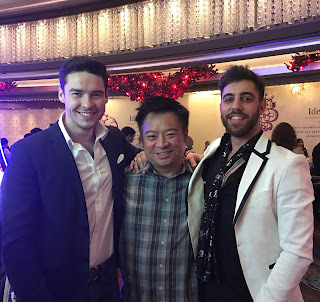 It was a pleasure to meet you both! Rex and I played more games but started to lose. We got carried away on Dragon Rising and we were betting $5.50 a spin. Unfortunately when we finally got the bonus it was very disappointing and only paid $95.00. We decided to call it a night since it was 4am or a bit later and meet up for lunch. Surprisedly both Rex and I wrote up before noon and we headed off for lunch at Milos which has that great prix fixe lunch menu for $25.16. The added cents to the price always cracks me up! 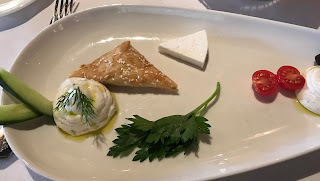 I ordered the Greek Meze plate for my starter. 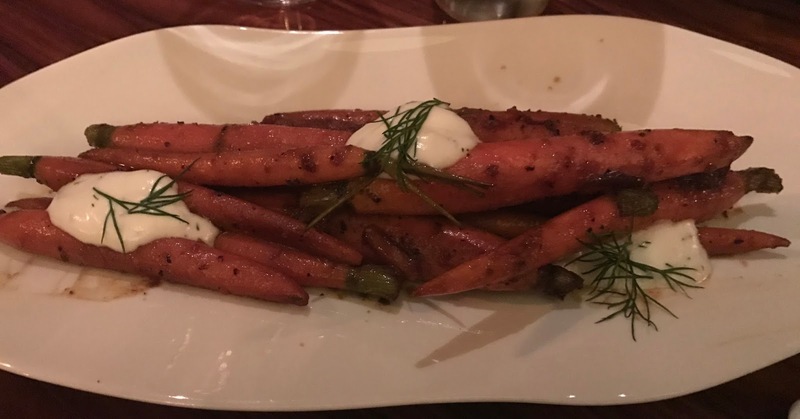 It was good but I think I should have gone with the tomato salad instead. Rex's entree was Nova Scotia deep sea lobster pasta. I had a taste of this and it was delicious! I ordered my usual the shrimp Saganaki and it was good, however I was disappointed they were no longer serving the side of Israel cous cous with it as I prefer that over the regular cous cous. Rex went with the Karidopita for desert which I believe is a type of walnut cake. I ordered the real greek yogurt, well because I love it and always order it. After lunch I had just enough time to return to my room and get my Halloween costume such as it was and meet Rex in front of the Chandelier Lounge! Below is Derek and Amy, such a cute little Red Riding Hood and scary Wolf! My friend Cathy is Cleopatra one of her favorite slot games. I'm not one for dressing up much so I'm the black widow or spider queen take your pick. Carolyn and Ed, so cute and their costumes are too! 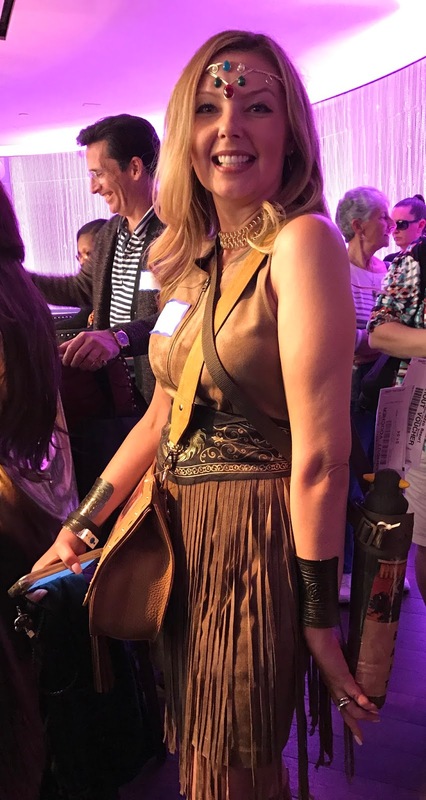 Vegaschic's costume as a Buffalo Hunter with casino titos as her bait and yes Buffalo is her favorite game! I loved this costume, so clever! 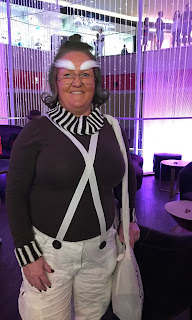 Vegasfan is the cutest Oompa Loompa ever! The cute little door signs that Aaron had made up! 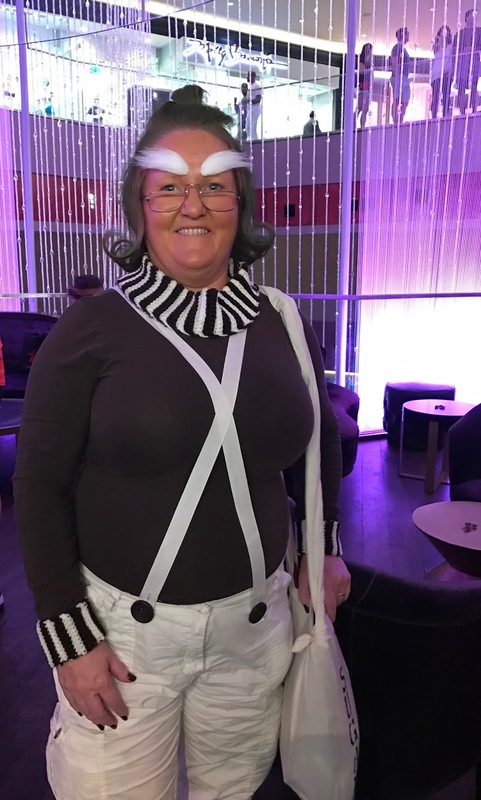 The most popular drink during the Halloween party was Schnozberries a tribute of course to Willy Wonka. 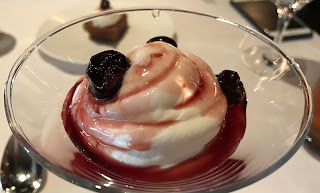 This drink has a fantastic presentation and you can see what I'm talking about in the video below that I took on a previous trip when I first ordered it. 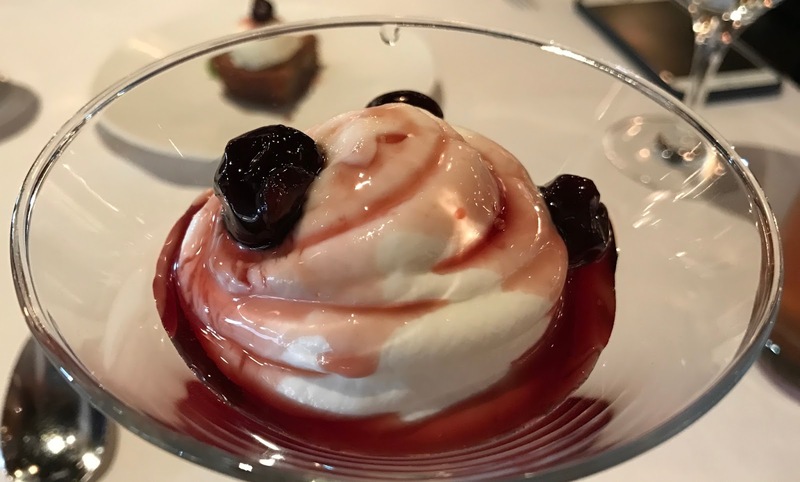 The drink is made from Dragonberry Rum, Sloe Gin, Aperol, Pickled Strawberry Lychee Pink Peppercorn Shrub, over a Miracleberry Ginger Gobstopper Ice Sphere with a scented Lolligarden! 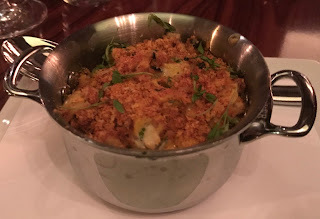 Here's a link to the first time I tried a Schnozberries. There's also a room tour in that video of a couple of the Cosmopolitan Terrace rooms. VegasMonkey went as Glen from The Walking Dead, but wasn't allowed to carry around his plastic machete so back to his room with the machete and back to his lucky monkey instead! I was going to start identifying everyone but have decided to only do it with people I have identified in the past and I know they won't mind. Stephanie, who I know from both VF and Joker's Wild Gambling Emporium. 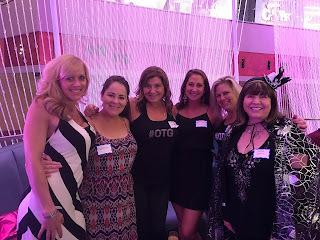 Friends of Beeejay, a great group of ladies. 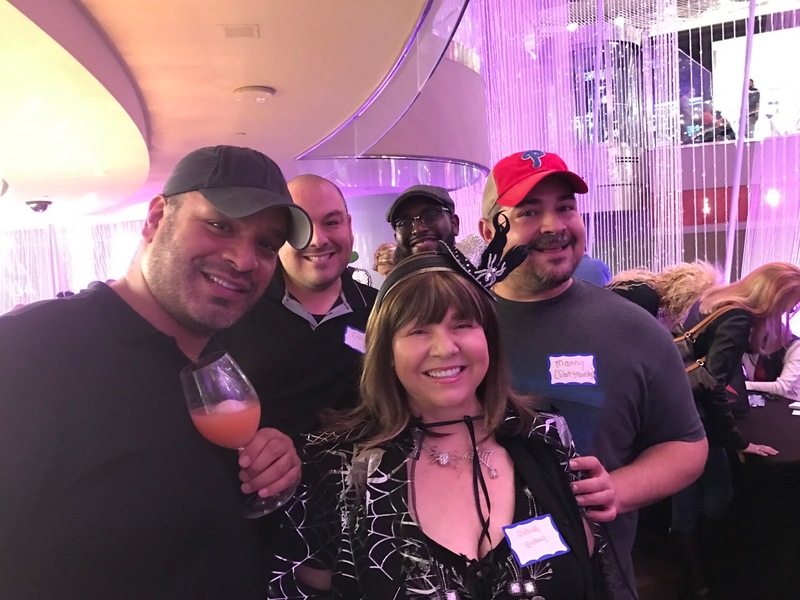 Hope to see them in Vegas again as I have a feeling we could get into lots of trouble together, LOL! Ed, Scott, Carolyn and Corey! 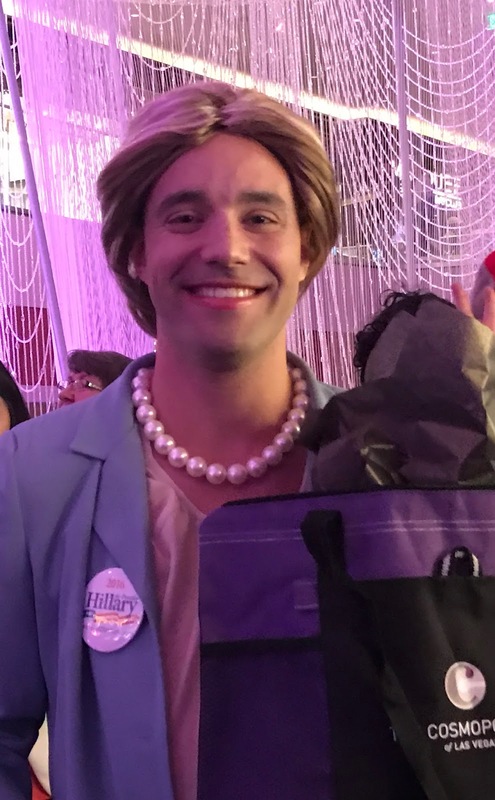 Above, Brian Christopher and husband as Trump and Hillary. 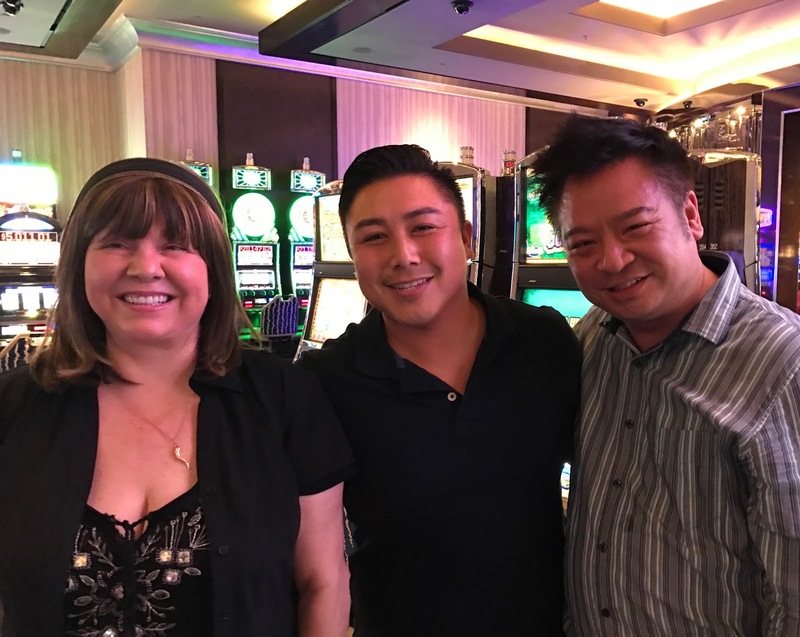 VegasChic, Kevin Sweet (Vice President of Slots and Operations at Cosmopolitan) and me! Scene from the Costume Competition! 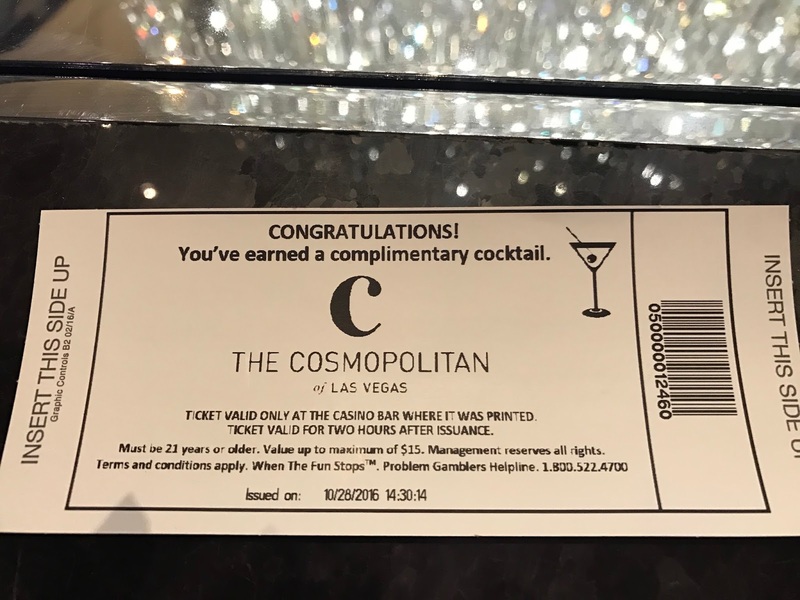 Cosmopolitan raffled off 4 or 5 gift bags of various prizes. 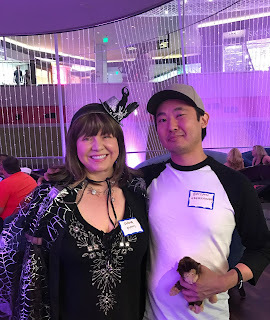 Aaron also supplied a lot of prizes for the party and Uncle Pauly gave out all natural dog treats for attendees who have doggy fur babies at home. I never win raffles, up until now! I won a very nice Cosmo Jacket, along with the carryon! That's Manny below photo bombing, he did that a lot during the party, LOL! 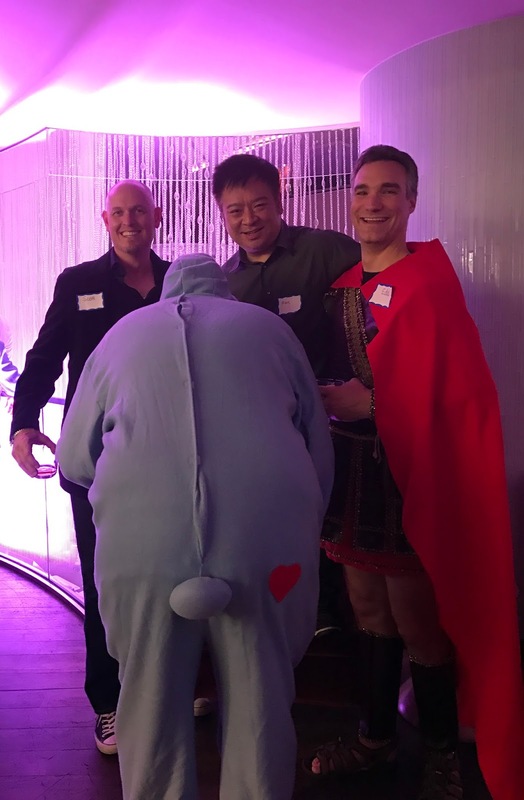 After our fun Halloween party attendees split up to return to gambling or other pursuits. 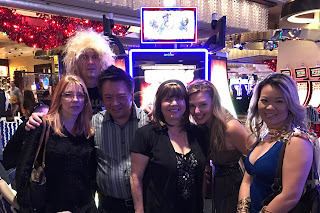 A small group of us pooled our money for betting high on Buffalo gold and we were rewarded with a handpay of $3768.00, which gave the 6 of us a $550.00 profit! Here's the video of live play from that group pull! 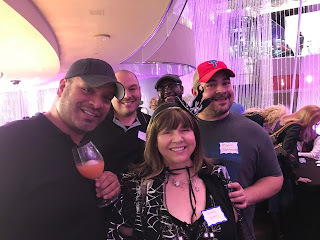 During our Buffalo group pull we were running late for our reservation for dinner at Tao and VegasChic went off to call Tao to tell them we needed to change our reservation to a later time, during her absence is when we hit the handpay, OOPS! After our win Rex, Vegaschic, Carolyn and I took Uber to Venetian for our dinner at Tao. We were in a hurry because we had tickets to Greg's show 50 Shades of Parody at Ballys! Greg was also at the Halloween party but he arrived a bit late and I forgot to take a photo of him. If you watch my video you will have likely seen and heard Greg in some of them. Tao was packed but we told our server we had to make a show and they proved their meddle by getting our food out very quickly to us. 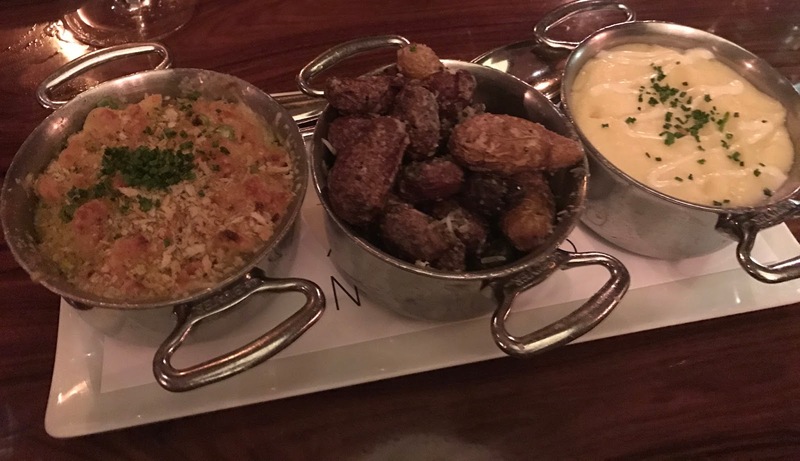 As always the food was great! 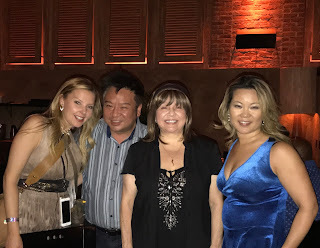 VegasChic, Rex, Carolyn and me at the end of our dinner at Tao. 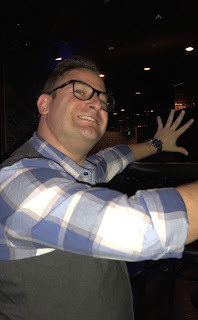 We took a Uber to Ballys and went up to the theatre where Greg came out to meet us. He escorted us pass the show lines, via the backstage and seated us at a great table before they let the rest of the audience into the small theatre. 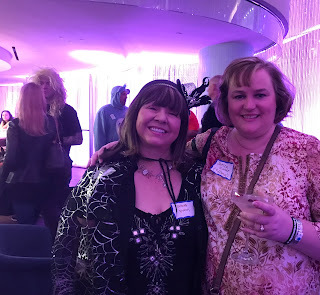 At the beginning they said no photos or videos, but I'm really sorry I didn't sneak some because Greg was fantastic as Christian Grey in 50 Shades of Parody. He has a great voice and stage presence and was hilarious. The rest of the cast was also funny and talented. This night was Greg's last performance in the role so I was very happy we got to see it. Our table at the theatre. After chatting with Greg after the show VegasChic and Carolyn returned to Palazzo where they were staying while Greg, Rex and I returned to Cosmopolitan to pool our money and play slots together. From Thunder Cash we went to Buffalo Grand where we had a good win of $887.01! Here's the video of our fun with Buffalo Grand! After Buffalo Grand it was around 3am and we split up briefly as I needed to use my point play on a game and also do my Facebook Slot Suggestion Videos. I lost on my FB slot suggestion games but managed to take out a little cash on Kitty Glitter using my point play. Greg and Rex met up with me in the HL room where we decided to return to the bank of Buffalo Gold games that our group had won the handpay on earlier. Since we were only three we didn't go for the bigger bet we won on previously but decided on $6.00 a spin. Well we hit a bonus that re-triggered and re-triggered and re-triggered all the way to a handpay of $3,542. 90! We had a blast, it was so much fun to win this together! Greg went home that night a winner, Rex either was even for his trip or won a little, while I ended up down $800.00 for my three nights! 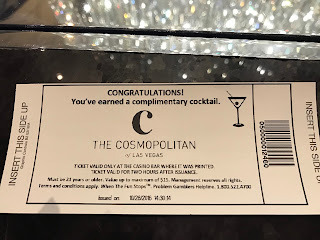 That first night of staying up until 5am did me in, but my Cosmopolitan comps were worth more then $800.00 so I'm happy! After this win I said goodnight and goodbye to Greg and Rex as it was 4am and I had a early morning flight. Video of our fun bonus with the wonderful handpay! Next morning I dragged myself out of bed having had only 2 hours sleep. I managed to make it down on time for my ride back in the Cosmopolitan Escalade to the airport. Flight was on time and my husband was waiting for me at the San Jose airport. Another fabulous trip with friends but with little sleep so I collapsed into bed for about 16 hours after I returned home! The potato chips and candy below are from Canada and courtesy of my friends Vegaschic and Carolyn! 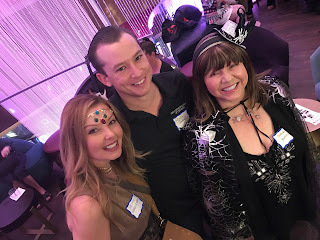 I think I forgot to mention that we had a representative from Ainsworth games at the Chandelier Halloween party and they gave everyone a nice goodie bag with a T-Shirt and a few other treats! I'm leaving for my next trip the day after I post this on my blog. I'll be staying at Cosmopolitan for two nights and then moving over for Palazzo for the last three nights and celebrating Thanksgiving there with my husband, adult son and friends. Thanks for reading and Happy Thanksgiving everyone!